SEVIERVILLE - The Tennessee Smokies, in conjunction with the Chicago Cubs, have announced their initial 2018 Opening Day roster for the upcoming season. The roster comprises of 14 pitchers, three catchers, six infielders, and four outfielders, with the team's first game scheduled for Thursday, April 5 on the road to face the Mississippi Braves. Among the 27 players assigned to the squad's initial roster, 15 of them played with the Smokies at some time during the 2017 regular season. The initial Smokies roster includes several of the Cubs' top prospects including, Oscar De La Cruz, Thomas Hatch, Michael Rucker, Zack Short, and Trevor Clifton. Yasiel Balaguert returns for the Smokies in 2018 as he provided the team with a great offensive presence in 2017. The power hitting first baseman comes off a 15 HR and 75 RBI campaign last season while posting a .256 batting average with the Smokies. Joining him in the infield will be a mixture of returners and newcomers to the club. Carlos Penalver returns to the infield for the upcoming season after posting a .254 batting average in 2017 with the Smokies. Also returning to the Smokies infield will be Jason Vosler. Vosler proved his power hitting ability in 2017 as he knocked an impressive 21 HR with 81 RBI, which ranked second in the Southern League in both categories. Trent Giambrone will make his Smokies debut in 2018 after spending 2017 in Myrtle Beach where he hit 12 HR with 44 RBI's. Zack Short will join the infield after spending time in both South Bend and Myrtle Beach in 2017 where he combined to steal 18 bases over the course of the year. Rounding out the infield will be Jesse Hodges. Hodges displayed his offense in Myrtle Beach throughout the 2017 campaign with 13 HR and 63 RBI's. The Smokies will have three returners in the outfield with Jeffrey Baez, Trey Martin, and Charcer Burks. Jeffrey Baez showed off some pop in his bat for the Smokies in 2017 with 10 HR as he appeared in 81 games. Trey Martin had an impressive 2017 campaign with .265 batting average while tallying 17 doubles throughout the season. The speedy outfielder in Charcer Burks had a great debut with the Smokies last year as he swiped 16 bases while also posting a .270 batting average. Eddy Martinez will be the lone outfielder making his debut with the Smokies in 2018. Martinez is coming off of a solid 2017 season where he hit 14 HR while at Myrtle Beach. Tennessee will start the year with three guys behind the plate. Ian Rice provided the Smokies with power last season with 17 homers and 52 RBI's. Erick Castillo also returns to Tennessee after appearing in 66 games with a .245 batting average in 2017 for the Smokies. Will Remillard will round up the catchers as he is assigned to the club for the first time in his career. Oscar De La Cruz will look to make a name for himself in Tennessee during the 2018 season, as he is ranked as the number 3 prospect for the Cubs by MLB.com. He made 12 starts with Myrtle Beach last year with a 3.46 ERA. Trevor Clifton will be making his return back to Tennessee after making 21 starts for the club in 2017 with a 5.20 ERA. The Maryville, TN native will look to build off of his 2017 campaign, entering 2018 as the number 28 prospect in the Cubs organization according to MLB.com. The Smokies will also welcome back Zach Hedges as he started in 22 games with a 3.49 ERA during last year's campaign. Preston Morrison will be heading back to Tennessee after appearing in 28 games with 19 starts in 2017 with a 5.51 ERA. Thomas Hatch will make his Smokies debut in 2018 on the mound as he spent 2017 in Myrtle Beach. He posted an impressive 126 strikeouts in his 26 starts for the club. Joining the newcomers of 2018 will be Duncan Robinson. Robinson made a combined 20 starts for both South Bend and Myrtle Beach in 2017 with a 2.21 ERA and also picked up 96 strikeouts. 2018 will mark the first season with the Smokies for Scott Effross, who made 42 appearances on the mound for Myrtle Beach while picking up 5 wins and a 3.40 ERA. Dakota Mekkes brings a solid bullpen presence to the club in 2018. Mekkes spend 2017 with South Bend and Myrtle Beach with a stunning 8-2 record and a 0.98 ERA. Tommy Nance comes to the team after his most recent appearance coming in 2016 with Myrtle beach where he recorded a 2.67 ERA for the Pelicans. Jake Stinnett comes back to Tennessee in 2018 after appearing in 9 games and posting a 0.61 ERA for the club during the 2017 season. Capping off the bullpen for the Smokies will be Daury Torrez. Torrez will be coming off of a stellar 2017 season with the Smokies where he picked up 6 wins with a 1.40 ERA. Mark Johnson returns for his third season as the Smokies' manager. Terry Clark also returns to the dugout as the pitching coach for this season as a few new faces will join the two. Ben Carhart will serve as an assistant coach this year for the club and Jesus Feliciano has stepped in as the hitting coach for this season. The Smokies' 2018 roster is preliminary and subject to change. The Smokies will commence their 2018 home campaign against the Jackson Generals on Wednesday, April 11, 2018. 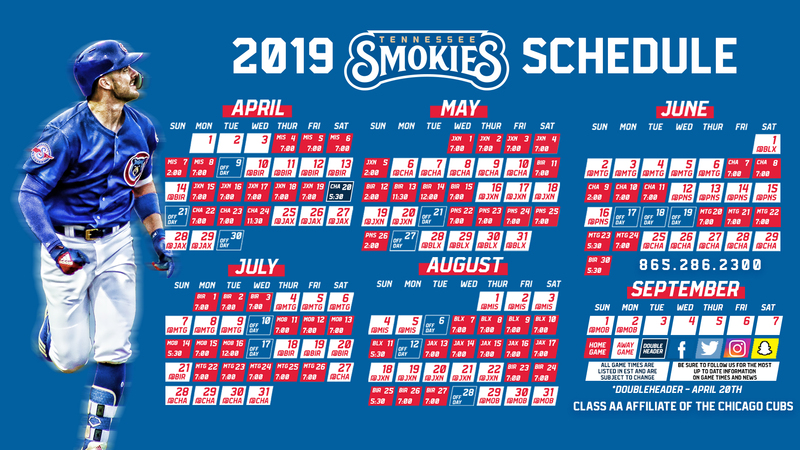 The full schedule for this season and information regarding single-game tickets, season tickets, and mini plans can be found online at smokiesbaseball.com, or by calling the Smokies Ticket Office at 865-286-2300. Click here to view the full initial roster.